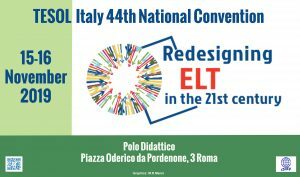 will take place on November 16th and 17th, 2018 in Rome at Polo Didattico, Piazza Oderico da Pordenone, 3. It seems that all previous conditions in English Language Teaching must be re-focused and observed under the lens of “liquidity”, mutability, permeability, cross-fertilization, hybridization, flexibility, and more. How do English language teachers envisage their role, profession and responsibilities in a period characterized by fast-pacing changes? Do they just need to adjust and adapt, or acquire other competencies? Let’s look at some examples and a few more questions. The demographics of Italian schools continue to shift, so how can teachers and schools best serve their changing population? Digital technologies have, so far, helped teachers work with learners and learners work independently. However, how should teachers approach and use all the new technologies and e-learning possibilities in order to carry out real innovation and change? What does the widespread use of English for intercultural communication imply for teachers? The varieties of English language (Global Englishes) produce transcultural flows and, as a consequence, new forms of global identification. How should teachers re-think their way of teaching, and how should they engage with the current world? The new CEFR descriptors emphasize mediation, the use of communication strategies and a new way of looking at native and non-native speakers’ interactions. How can teachers most effectively implement all this in their classrooms?